# Fill the cocktail shaker with the strawberries. # Add the mint sprigs. Only use the mint leaves and discard the stems. # Use a muddler or a blunt kitchen utensil (like the handle-end of a spoon) to mash the ingredients together until they mix into a mash. 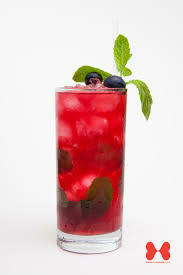 # Fill the shaker with crushed ice, directly on top of the fruit and mint pieces. # Add the rum. You should see the liquid rise almost to the surface of the ice. # Cover and shake well. # Pour into a tall glass. # Top off with a splash of club soda. # Garnish with a fresh strawberry, stem still intact. It's now ready for serving. How to Make the Perfect Mojito!